GooglePlus Helper: Comments, why do we post them? Comments, why do we post them? In Google+ or other types of social networking, making comments means you're not just putting unchecked ideas into the Circleverse. 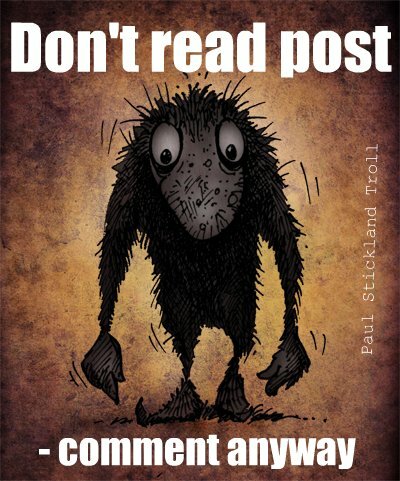 Do you read a post before commenting? Are you guilty of the "too long didn't read" thought, or do you usually read the whole post before commenting? I've noticed in many discussion threads that people don't seem to get the gist of the original post, but perhaps after only lightly skimming through the text or just looking at the image are very sure of their strong opinion. Or have a chip on their shoulder and think that everyone is ganging up to them. Or is their opinion based on the post's headline? Or just the photo / picture? Even though they're not actually talking about the same thing as the original poster meant to convey... They just think they are. Or want to be trollish. Venting a real or imaginary frustration. One annoying tendency I have noticed is that sometimes the original poster deletes quite rational comments if someone disagrees with them. Wanting only to push their own ideas or side of the story. That's not a conversation or discussion, that's just selfish - sometimes resorting to twisted facts for the rest of the readers. Unfortunately based on my experience these people often are trolls or bullies themselves: They post about imaginary slights because someone else "didn't let them say what they wanted (Freedom of speech!) in someone else's comment thread" and they need to make sure that all their followers see the wrong that the innocent OP has suffered. All of the above is rude. Do we have conversations because we want to put ourselves in the limelight, let off steam, spite someone or to understand our thoughts better and learn from others? Accepting differences in opinion? Perhaps you're rather airing your ideas, collaborating to build something more refined? We also talk to each other so we can build social relationships which may be useful to us later: But often enough, we share knowledge for its own sake. 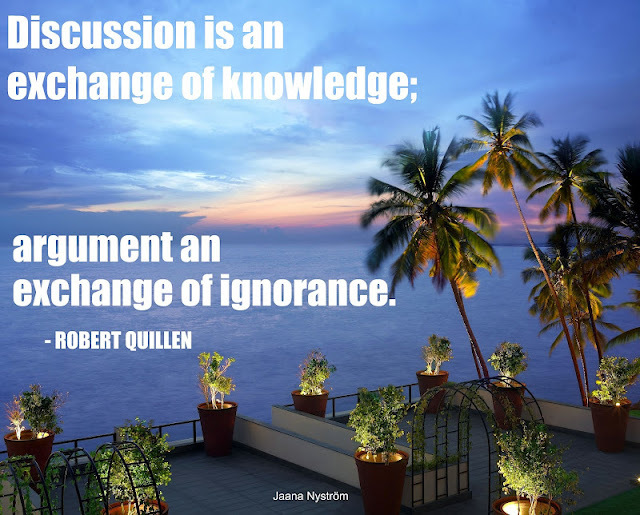 We build our collective understanding by talking to each other. Commenting is talking, too. But the most important aspect is respect. Would you go to a party and just shout hi to everyone? Commenting intelligently and on the topic is a behavior that is its own reward. For anything else, there's the +1 button. You may disagree with me and refer to freedom of speech and for every man's right to do what they want (anarchy?) 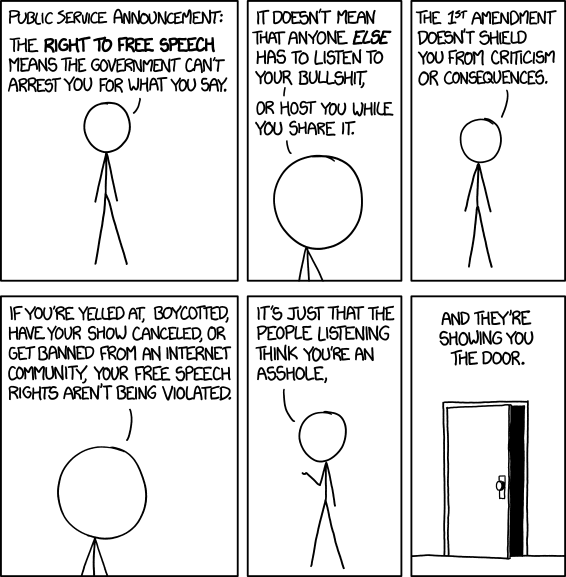 but I use my freedom to voice out an opinion and wish that one-liners be kept for funny gifs or similar. The 'Add me to your circles' comments or obvious young male chat invitations, well... Hmmm. Why one should think before commenting? I try to post about my good experiences on Google+, tipping people with extensions or features that I find useful. Then someone writes in the comments that "I would never use that browser / extension / software" etc continuing "and the world is flat, the sun is blue and my phone bill is already big enough..."
This kind of behavior is very disheartening for the people in many cases only trying to be helpful. They might think twice before posting any more advice because in the comments they get very nasty jibes about not ever doing what they advice. Where's the community benefit in that? If you do hate something on Google+, why do you have to spoil it for others, too? Do send Feedback to Google if you think you have a cause for it. Negativity does not get you anywhere. Is it too much to ask, that people would read and think about the message before commenting? My mother used to say that if you don't have anything nice to say (unless specifically asked for critique) then it's better to say nothing. And on social media, if it should happen that a post really is too long for someone to read, to refrain from commenting altogether. I love to get comments on my posts and try to read the comments on someone else's post before adding my bit. If someone has already expressed my sentiments I many times just +1 that comment and move on. But pure negativity without any helpful critique is just depressing. We can't all like everything, but there are ways and places to bring it out. Like in one's own posts or sending Feedback. Ranting on anyone else's post is not very nice. Not cricket. I'm not inventing rules here: There is no must on Google+ but like in life, there is an etiquette. This quote, in many ways, applies to commenting on content as well. People sometimes comment just to be heard not because they understand the content and have something of value to add. I saw this a lot when I was using Facebook, not so much on Google+. That's what I love about Google+, with the exception of the occasional troll, the content of most comments I've seen in my feed and the communities I participate in are respectful and add value to the overall communication experience. Even when expressing opposing opinions. That's what makes Google+ so awesome! This post is not meant for spammers or sociopaths—nothing will alter their behavior. My goal is to help “the rest of us.” But first, you may wonder why anyone should care about crappy comments—after all, Google+ is a public forum, and readers can ignore the crap. Think of Google+ posts as a restaurant, and the comments are the public sidewalk in front to it. Many people make one-word comments with good intention. Others do it to “join the party”out of sheer enthusiasm for the post. Unfortunately, a few people do it because they want attention and to just see their comments appear somewhere. You can see this when there are comments such as “cool” and “LOL” that don’t make sense for the post. Read the full article "The art of Google+ comments"
You could modify your settings to limited circles or friends only but in a way it's really annoying: Especially in cases when someone posts to communities like the Google+ Help, asks for advice and then does not let the public help them... Or only accepts comments that are in line with their thoughts. There have been incidents with the most popular lady users where they have been forced to limit the comments to their posts. If you feel uncomfortable with the great masses, you don't have to leave Google+. Just decide who can comment, interact or even send you messages. Take screenshots of everything. All the comments or posts - if someone is truly attacking you. Possibly even share the screenshots with +Google+ Help in a private message by +mentioning the Page and making sure there's nothing else in the sharebox, like "Public". Just flagging or deleting the comments or posts does nothing, you must Report abuse and block the abusive user's profile. +Guy Kawasaki latest post on comments: The art of Google+ comments is a bit different from the article linked before. I've done a few tests: Sharing posts where the link is broken. The best result? 20 comments about the blog article in question without the commenters even reading it. Your post is very well thought out, and I agree that many people are simply posting to see their names in lights. I'm trying to find interesting and thoughtful commentaries on my ideas. I've not used facebook much because I see too much of what you talk about here. I'l also relatively new to Google+. So how have you wisely expanded your circle? For widening your circles or getting more people to circle you: There is no shortcut to happiness. By being consistent and if doing business, not just marketing your wares or services. By sharing, giving +1:s and commenting yourself on others' posts. By adding interesting people to circles. Try Google+ search for your keywords, see which people / pages are writing about the same topic and circle them. Use those keywords and #hashtags on your posts, fill in your profile, tell us about yourself / your business, link all the other social media profiles, blogs etc to Google+. Very different blogging topic, I love it! It's always motivating to reach outside of the box when writing a blog post when you see other respected individuals doing the same. Keep up the good work!